When it comes to bathrooms – and especially modifying or reconfiguring them – there are several considerations that need to be factored into the discussion. Foremost is safety. The CDC reports that annually nearly one-quarter of a million people (234,000) seek emergency room attention for a fall in the bathroom. Maneuvering space has a lot to do with this. Additional concerns are the number of people (not all at one time) who will be using the main bathroom and their particular needs, having a guest bathroom (powder room or hall bath perhaps) for use by people who don’t live in the home as well as it being located in a convenient location for occupants of the home, lighting in bathrooms is notoriously weak and inadequate, flooring tends toward the slippery side (especially when wet or damp), and doorway access is traditionally narrower than it needs to be. Then, there are the fixture choices and how well those suit the needs of who will be using those bathrooms as well as how those rooms are configured. Essentially there are two styles of bathrooms when it comes to flooring. One has wooden floor joists or wooden engineered trusses supporting the floor and the bathroom itself. The other has a concrete slab providing the support. Two story homes that have a slab for the main floor typically have a wooden flooring system for the second floor (and third when included). The wooden construction allows a rather easy reconfiguration of the space when it comes to moving drain lines, water lines, or electric wiring when they can be accessed from underneath such as from a basement or crawlspace. For second floors, the subfloor of the bath and potentially all of the fixtures will need to be removed first. When working with a concrete slab floor, it may seem that there is a lack of flexibility and that the choices are limited, but think again. Just because the floor drain for the tub or shower is located where it is, the toilet is located where it is, and the sink is where it is, does not mean they have to remain there. Sure, it is easy to replace the fixtures with newer, updated ones and leave them where they are, but this may not be what is needed or desired. Breaking out the concrete to move water or drain lines is a little messy (cement dust) and noisy and may be a little expensive (or not so much depending on where the home is located). Nevertheless, it can be done, is not that big of a deal for a contractor to do so that the plumbing fixtures can be moved to exactly where they are needed and desired. Knowing that plumbing fixtures can be moved to any location in the bathroom space they are desired gives total creativity to the design. They don’t have to be moved from they are, but they don’t have to remain there either. As far as the fixtures themselves are concerned, consider what is beneficial to have to serve those living in the home. Needs are subject to change, but let’s make our best guess at this based on what they are now and how they might change if that is a possibility or it is known. 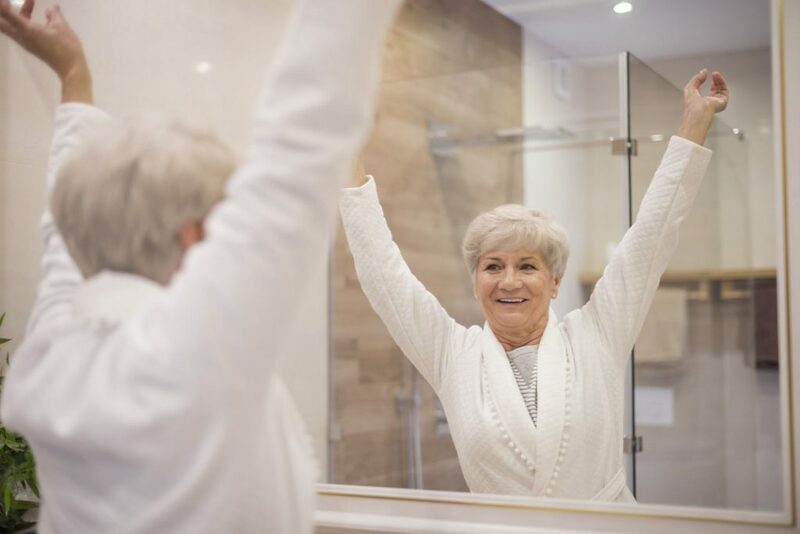 For instance, a tub with a shower or a tub and shower combination can be replaced with a roll-in (curbless) shower in a size appropriate for the space and the needs of those using it – with it being as large as desired, subject to the overall space constraints. The drain, water controls, and shower head(s) can be located as desired. A handheld or personal shower is quite popular now, and having this installed is a great idea – along with a hose long enough to reach the entire shower area, a bench or fold down seat on which to sit to use it, an on-off control on the wand or head, and a rest or cradle on which to hang it. For the toilet, a comfort height toilet is often suggested, but this works best for taller individuals or those with difficulty in sitting. There are three sizes of toilets – standard (14-15″), higher (15-17″), and comfort height (17-19″). Some can be found higher, and the wall-hung tankless toilet can be mounted at any height and save floor space as well. There are models with bidet seats available, and these require a GFCI receptacle nearby. The sink can be wall-mounted, pedestal, in a cabinet with a countertop (drop-in, integrated, or undermount), or on the counter (vessel). It can be a corner-mount also, and there can one or two of them. There are many other considerations for the bath (doorways, shower enclosures, type of flooring, wall tile, grab bars, drain systems, outlets, sitdown space, mirrors, and more) depending on personal needs, budget, and how extensive of a renovation is desired. Working with the three main fixtures in the bathroom is the place to start, and the project can branch out from there.